It is enshrined in the Lord's Prayer. It has been spoken about in parables. It has been put through a mathematical formula that ends in infinity. It is also the lubricant of relationships, the essence of living, and the vital ingredient in the spiritual vitality of anyone. It requires the biggest step of faith anyone can possibly undertake. It is the bridge over all waters, not just troubled ones. The Hebrew language has three different words to describe it. Biblical Greek has two. It is something easy to blurt out, but incredibly hard to put into action. The deeper the thorn, the more painful the act of forgiveness. This week, I like to suggest the following. Forgiving others is hard, difficult, and may even be impossible. Not to forgive is harder, more difficult, and will become spiritually deadly. I remember hearing about gender differences in young children's behaviour. A study was shown about a group of kindergarten boys playing out in the field. Invariably, as kids push and shove one another in ball games, running in the park, or just having fun, there will be fights and nasty situations. The boys played in their special corner while the girls at another. At each fighting or quarreling, it was observed that the boys are more physical. They argued and soon teachers needed to separate them and forced them to apologize. Grudgingly they would shake hands and utter out a reluctant "Sorry." Soon after, their focus turned to the games and toys they were playing, and things amazingly returned to normal. The girls were a little different. If there was a fight or tiff, even after the apology, any games or playing would come to an abrupt halt. It seemed like the girls tended to take a much longer time to be recover, if it ever were normal again. While the boys returned to their open games, the girls returned to their closed corners. Of course, there are many other studies that show gender differences in other ways. One such study of 1400 college students shows us that men found it harder to forgive. One striking comment made by the researcher is this. This comment is particularly revealing as our ability to forgive or not forgive, is a reflection of who we truly are. If we see ourselves larger and more righteous than others, it is much harder to forgive. A guest speaker at Regent College recently broached this question: "Do you want to be right or do you want to be loving?" Whether we are kids or adults, male or female, we all have to decide. Of course, many of us will claim on both. We want to be right as well as loving. That would be sidestepping the main question. 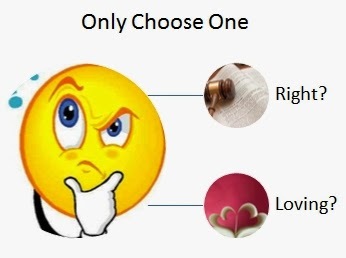 If we can choose only one, would we prefer to be right or to be loving? People who insist on the former will find it most difficult to forgive. Which is why Jesus' words are particularly instructive. In the parable of the unmerciful servant (Matthew 18:21-35), we see the linking of mercy with forgiveness. After Jesus' famous answer of forgiving people "seventy-seven times," he followed it up with a story of the kingdom of God, like a king showing mercy to his servant who owed 10000 bags of gold. Taking pity on the fearful servant, instead of following through with threats, the king decided to do the unexpected. He forgave the debt totally. He freed the servant from all obligations to repay the debt. He totally forgave the frightened man. Unfortunately, such immense gesture of grace was not paid forward. The ungrateful servant, having benefited from the generous act, instead of paying it forward, failed to show mercy to a fellow servant who owed him a mere 100 denarii, which was about a day's wages. How could that happen? How could anyone be so ungrateful? Forgiveness is exactly like that. Each time we fail to forgive, we become like that ungrateful servant. The king had absolute right to punish the servant for a debt unpaid. Yet, he held back the rod and chose to be loving. The servant was also right to demand repayment from his fellow servant, but he chose to be unloving. Forgiveness is the biggest difference between right and wrong. One can be totally right but remains absolutely wrong in the area of forgiveness and mercy. If there is any one clue of how Christlike we are, it is in the act of forgiveness. This single effort outweighs all other disciplines. One can pray from day to night. One can serve 7 days a week in Church or charitable organizations. One can even give generously to many worthy causes. If there is unforgiveness, these good works are like filthy rags that we are using to clean the house of God. They are like contaminated cutlery we use to feed people. They resemble the hypocritical acts of the Pharisees during the days of Jesus. Unforgiveness is the foot at the door that opens opportunities to invite the devil in. It breeds hatred. It builds up animosity. It displeases heaven. It denies the grace of God who had already forgiven us. It is that single biggest slap on the face of Jesus. It is our shameful "penny-wise, pound foolish" behaviour that prefers the fear of hiding ourselves over the faith of humbling ourselves before others and God. I like the words of Mahatma Gandhi that speaks the truth about forgiveness. When we insist on our rights or how right we are, at the expense of loving our neighbours, we are insisting on God's right to do to us what we are doing to others. If we do not forgive, we are choosing to live in human weakness instead of God's strength. That is why the story of the fig tree is particularly revealing. After Jesus had cursed the fig tree, the tree withered. Then Jesus launched himself into teaching about faith and forgiveness. That begs the question. What on earth has a withered fig tree to do with faith and forgiveness? Several things come to mind. First, bearing fruit is our calling as a disciple. A fig tree that does not bear fruits will be destroyed. What use is a fruit tree that consumes precious nutrients but produce nothing useful? It is good for nothing but to be cursed into oblivion. Likewise, only a good tree will bear good fruit. Showing forgiveness is a good fruit of faith. Why the fruit of faith? Secondly, forgiveness is a response of faith. Refusing to forgive one another is an exercise of fear, not faith. Notice how Jesus responded with: "Have faith in God." It tells us that forgiveness is not a self-driven endeavour. It is a response to God's work in our hearts. Jesus knew how difficult forgiveness is. It is as difficult as asking a mountain to cast itself down into the sea. Yet, in faith it is possible. Forgiveness is that willingness to let go and let God help us be forgivers in faith to forgive others in return. Thirdly, the lack of forgiveness is the single biggest barrier to any answer for prayer. Note the words of Jesus, "And when you stand praying, if you hold anything against anyone, forgive them, so that your Father in heaven may forgive you your sins.” Why does Jesus link prayer with forgiveness? It is simply because our capacity to receive God's blessings is tightly connected to our ability to forgive others. Unforgiveness is like a bowl full of dirty leftovers, that prevents any new food from entering. Moreover, any new food will be contaminated. Forgiveness enables us to start afresh with clean hands and cleansed hearts. How then does unforgiveness lead to dead spirituality? Three ways again. When we do not forgive another, we are not bearing fruit. We will be people who has the potential but refuses to utilize them properly for the kingdom of God. In failing to produce fruit, we will be useless salt that is good for nothing but to be cast out and to be trodden under the feet of people. When we do not forgive others, we do not act in faith. We are choosing to believe in our own abilities, our own interpretations, our own comfort behaviours, and denying the power of God available to us. In other words, in unforgiveness, we cannot claim to be of God. We are on our own. When we do not forgive others, we become wholesome impediments to prayer. God wants to answer our prayers, but we want to block God from doing what God wants to do. Are we able to suffer the consequences of not bearing fruit? Are we disciples if we do not live out in faith? Are we praying effectively? If the answer to any of them is no, we have a deadly spiritual problem. We are what we forgive or not forgive. It is the most important action any one person can ever do. It also seems to be the most difficult. Mind you, not to forgive is harder, more difficult, and spiritually deadly.